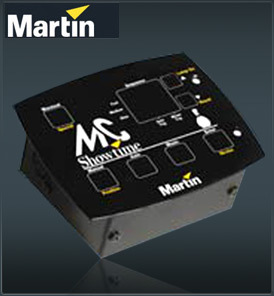 Instant “show time” is now possible with this user-friendly, plug and play show controller for the Martin MX series of scanners. MC Showtime is a pre-programmed "ready to go" controller offering 30 ever-changing light shows. MC Showtime also supports the Martin CX series of color changers, as well as the SynchroZap and Acrobat intelligent effects. Easy to set-up and operate, MC Showtime houses 10 slow, 10 intermediary and 10 hyper light shows, giving you the flexibility to set the mood. MC Showtime controls four or more MX-scanners (MX-1 or MX-4, depending on the MC-Showtime model) automatically, manually, or by triggering any of the 30 pre-programmed 6-scene sequences. MC Showtime also supports the Martin CX series of color changers, as well as the SynchroZap and Acrobat intelligent effects.